Astroinformatics is a thriving new discipline that has emerged at the intersection of astronomy/astrophysics, applied mathematics and high performance computing, arising from the need to address the challenges and opportunities of exponential growth of data volumes, rates and complexity from the next-generation telescopes. During the last two decades, many important new astronomy facilities have been installed in Chile, among them Gemini-South, SOAR (AURA) and VLT Paranal (ESO). Together with the extensive existing facilities, these have created a unique astronomy infrastructure that has triggered the planning and construction of a wide range of major next-generation optical and radio astronomy facilities. Prominent among these latest projects are the ALMA Observatory (recently inaugurated), the LSST (Large Synoptic Survey Telescope) and the E-ELT (European Extremely Large Telescope), which will bring new frontier of technology requirements for massive data flow management. In fact, the sensing, transmission, process, analysis, storage and archiving of tera- and peta-range volumes of data that these new facilities will need, require a robust set of interdisciplinary skills and this is the right moment to develop them. 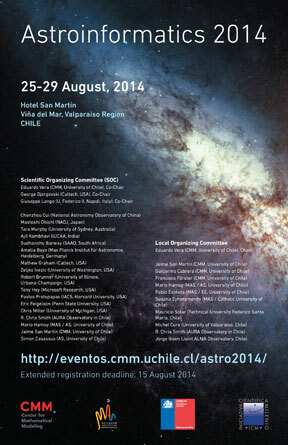 Within this context, we are specially pleased to host the Astroinformatics 2014 Conference in Chile (Viña del Mar, Valparaíso Region) that will offer a unique opportunity to address and discuss many of the relevant scientific, technical and infrastructure issues behind the emerging era of big data in astronomy. Each of the four preceding international Astroinformatics conferences have built up a track record of discussion and testing innovative ideas and building broad collaborations. These efforts have formed between not just astronomy institutions but also between astronomy and other disciplines, even including commercial partners, to everyone’s benefit. Student Registration Fee: CLP 100,000 or USD 200 (includes welcome reception and conference dinner). A limited number of student registration waivers will be available. For further information contact Francisco Förster – fforster@dim.uchile.cl.